Information on the social life in Vijayanagara Empire comes from writing of foreign visitors and evidence that research teams in Vijayanagara area have uncovered. The Hindu caste system was prevalent and rigidly followed, with each caste represented by a local body of elders who represented the community. These elders set the rules and regulations that were implemented with the help of royal decrees. Untouchability was part of the caste system and these communities were represented by leaders. The Muslim communities were represented by their own group in coastal Karnataka. The caste system allowed distinguished persons from all castes from being promoted to high ranking cadre in the army and administration. 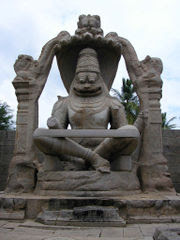 In civil life, Brahmins were religious enjoyed a high level of respect. As for clothing, well-to-do men wore a tall turban made of silk and decorated with gold. Jewellery like anklets, bracelets, finger-rings, necklaces and earrings of various types were used by men and women. During celebrations, men and women adorned themselves with flower garlands and used perfumes made of rose-water, musk and sandalwood. Queens and princesses had numerous attendants who were lavishly dressed and adorned with fine jewellery as their daily duties were light. Sports and entertainment were important. Gymnasiums have been discovered inside royal quarters and there are records of regular physical training for commanders and their armies. Excavations within the Vijayanagara city have revealed the existence of various types of community-based activities in the form of engravings on boulders, rock platforms and temple floors, implying these were places of casual social interaction.